How Many Organelles Are in a Cell? Cell organelles are specialized structures of the cell. They are responsible for various important and vital functions. Each organelle contributes in its own way to help the cell function as a whole. As the body has many different organs, the cell has many different organelles. This is the simplest organelle definition. However, there are two main types of cells, prokaryotic and eukaryotic. The prokaryotic cell doesn’t have a membrane-bound nucleus and neither do the organelles. In this article, we’ll talk only about organelles found in eukaryotic cells. Organelles are located in the cell cytoplasm. This is the reason why the cell nucleus is not an organelle because it is not located in the cell cytoplasm. 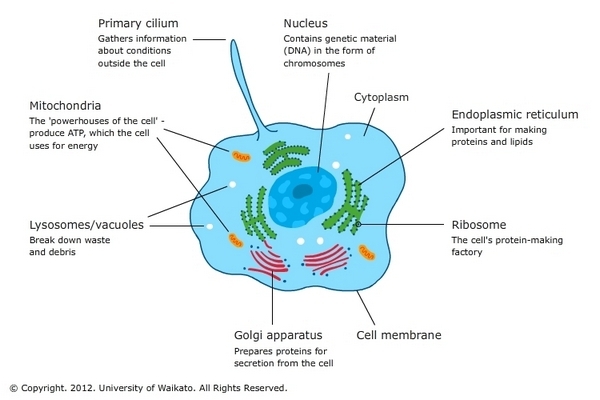 In general, there are 8 types of main organelles in a cell: chromosomes, mitochondria, Golgi apparatus, endoplasmic reticulum, ribosome, microtubules, microfilaments and lissome. If we are talking about animal cells, then animal cell organelles include centrioles and microfibrils (besides organelles mentioned above). How many organelles are in a plant cell? Plant cell organelles include the plastids (besides organelles mentioned above). In general, the composition of organelles in the cells may vary significantly depending on the type of the cell itself. Now let us describe the list of organelles and their functions. The plasma membrane is a thin envelope around the cell consisting of lipids and proteins. The plasma membrane transports water, minerals and organic matter into the cell and removes harmful waste products and protects the cell. Cytoplasm – the inner semi-liquid medium of the cell. 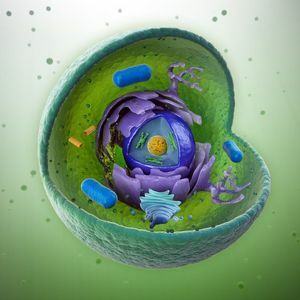 Cytoplasm provides the connection between the nucleus and other organelles. The endoplasmic reticulum is a network of channels in the cytoplasm. The endoplasmic reticulum takes part in the synthesis of proteins, carbohydrates, and lipids. Besides this, it is engaged in the transportation of nutrients. Mitochondria are organelles responsible for organic substance oxidation. Besides this, mitochondria synthesize ATP molecules with the enzymes participation. In general, mitochondria are organelles that synthesize energy; they are the “powerhouses” of the cell. Plastids (chloroplasts, chromoplasts) are found only in plant cells. Their presence is the main feature of the plant. They play a very important role. For instance, chloroplasts contain chlorophyll – green pigment and they are responsible for the photosynthesis phenomenon. Golgi apparatus (Golgi complex) is a system of cavities inside the membrane. Golgi apparatus carry out the synthesis of fats and carbohydrates in the membrane. Lysosomes are little bodies, separated from the cytoplasm by the membrane. Lysosomes speed up the reaction of the breakdown of complex molecules. They do this with the help of special enzymes inside. In addition, the lysosomes ensure the construction of protein in cells. Vacuoles are cavities in the cytoplasm. They are filled with cell sap and are responsible for the accumulation of spare nutrients. Besides this, vacuoles regulate the water content in the cell. All organelles are important, because they regulate the vital activity of the cell.